The concept of selling hasn’t changed over the centuries. There is a product or service design to match a customer, but what has changed is the way by which organization has sold or market to the customer. One of the methods we teach is to bring selling back to the basics. 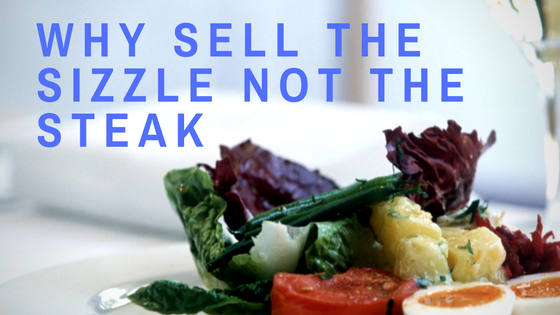 Sell the sizzle, not the steak. Meaning it is selling has nothing to do with you. It is all about the customer. The person or company: How many times you hear it is all about the company. One you hear all the time is how many years they have been in business. Also how the son has taken over for the father or grandfather. Also, another is how many locations they serve. This is to show how big they are and how long they have serviced their clients. It is good marketing but does is say to a potential client how they help their needs. 2. The Product or service itself: You ever hear the product is so good that it sells itself. This can be true in certain cases. QVC and Home Shopping network are the kings of putting the product that is key for the customer that are impulse buyers. They sell it a little and then numbers start to roll in. They to create more buzz or pressure when they create the old scarcity process where there is only a couple left. It pushes the maybe buyers over the edge emotionally. Some sales people sell on the features of the product or service hoping with all the features that it is enough to close the sale. If the product can be sold with little or no sales skills then you are an order taker. 3. The customer or Customer: The concept is the best to know and use. We teach the sale has nothing to do with you or your product. It has to do with the customer. When you concentrate or gear you sales pitch around what the customer wants then you are better ensuring a sale. It is all about the customers wants. People buy more what they want than what they need. Your house need a new water heater but you going to instead buy the new pair of jeans first cause you want not need them. Every great salesperson learns it is more about the customer than who they are features of the product. Focus your selling on your customers wants and highlights of the product or service you are sell. In some cases, it is all about the sizzle, not the steak. How your product is going to make them feel when they use it is key.